So, all five of us are in Seth's room. Prayer time. John Mark, two, is usually in bed before his siblings. He's still awake tonight. Overly energetic. I'm kneeling down beside Mary Elizabeth. Trying to bring calm. Melanie is about to sit on Seth's bed when he announces contrary plans, "I want John Mark to come up here on my bed with me. Daddy, you come up here." Me & John Mark together on Seth's bed doesn't compute in my Daddy brain. Maybe I blew that fuse during my morning sermon prep. Maybe I tripped that breaker running around with the kids before suppertime. So I ask, "Why do I need to come up there, Buddy?" 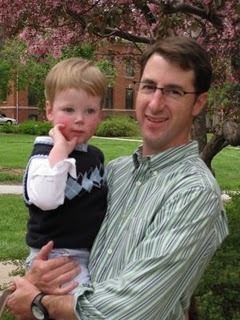 In second-grader simple logic Seth states, "John Mark's attracted to you, Daddy. If you come up here. He will too." At least in the eyes of his almost eight year old brother I am. That's something, right? I may have thinning hair, an average face, & a less than stunning physique, but I can attract the toddlers. Watch out, world! I have to ask, however, as a Christ-follower: Who am I attractive to? What might make me attractive? Jesus says he will draw all men to himself if I will lift him up.